The Evolution of — Blondes! NOT a joke, but a sober article at the Times of London on blondeness in women as an evolutionary stategy in Paleolithic Europe. ” ….Frost attributes the rapid evolution to how they gathered food. In Africa there was less dependence on animals and women were able to collect fruit for themselves. In Europe, by contrast, food gathering was almost exclusively a male hunter’s preserve. The retreating ice sheets left behind a landscape of fertile soil with plenty of grass and moss for herbivorous animals to eat, but few plants edible for humans. Women therefore took on jobs such as building shelters and making clothes while the men went on hunting trips, where the death rate was high. From Steve Sailer (scroll down) who also has some theories why blondeness could be a disadvantage for male big game hunters, especially in sunny climes. Having traveled in Moslem societies benign and… not so benign, I enjoyed this Indepundit post on the pleasures of Dubai (which include pork barbecue, beer, and Christmas). Contrast it with this Saudi woman’s experience at The Religious Policeman. .. new (proposed) law I have ever heard about. Tom McIntyre sent me a link to this column. “David Paterson is trying to ram legislation through the Senate that would require New York cops to shoot to wound. He would make it the law that when a police officer fires at someone, he has to aim for an arm or a leg. “An officer who failed to do so, and fatally wounded someone, would be hit with a new cops-only charge of second-degree manslaughter. “Did I mention that David Paterson is the Democratic leader in the New York state Senate? Did I mention that he’s been in office for 20 years and that he is the darling of the New York City elites? “Specifically, it would require every officer who fires his gun to be able to match the fantasy shooting of Hollywood movies. In the real world, it is not possible to specifically shoot someone in an arm or a leg. Handguns are just not that accurate and the conditions under which officers fire their guns simply do not allow for carefully aimed shots. “When a cop has to fire his weapon, there is a life on the line. The life of either a cop or an innocent civilian. When a cop has to fire his weapon, he has to do it right now. Because if he doesn’t, the great likelihood is that the bad guy is going to fire his gun and somebody is going to die. “The reason police shoot people is to try to immediately stop a threat to the life of the officer or a third party. You don’t shoot people to catch them, you shoot people to keep them from killing someone. “And to do that, you have to incapacitate them immediately. You must deliver a wound that turns them off. A shot to the arm or leg is not likely to do that. It is merely apt to make the bad guy angrier and more resolved to continue his dangerous behavior. When the cops shoot somebody, that somebody has to go down, hard, or the threat to innocent life continues. “The most fundamental weakness of David Paterson’s legislation continues to be its practical impossibility. It is simply not possible to reliably hit an arm or leg with a pistol. In close-quarters handgun fights, 80 percent of the shots fired don’t even hit the person they’re aimed at. Just 20 percent of shots fired hit their target. “And by “target” we mean person, not body part. “That’s why police officers and members of the military are taught to aim at “center mass.” That means aim at the biggest part of the target that presents itself. Typically that is the torso. I thought that , well, this must be an exaggeration, so Googled “Paterson Law”. Every hunter of deer and elk in the central Rockies is aware of CWD, a “mad cow” – type prion disease that is spreading there. Ted Kerasote sent this disturbing link to a study that indicates muscle meat may be infective. “The discovery that CWD prions are in meat, comes at no surprise. The fact that transgenic mice – made genetically susceptible to CWD will develop CWD when fed muscle tissue, is also no surprise. There is also an old study, in vitro (test tube) that shows that CWD prions convert human prions to the malignant state at about 7% infectivity (CJD prions, under the same in vitro conditions, convert health pre-pirons at 100% into malignant one). That’s in vitro, not in vivo. Something appears to prevent in vivo infections in humans. A Jurassic mammal, far more advanced than we usually think such beings were, has been discovered in China. Though apparently unrelated to living lines, it had the tail of a beaver and, apparently, a lifestyle something like an otter or platypus. We often think that because we have a few fossils we have some idea of what the ecological and evolutionary web was in “Deep Time”. We do not. Aso here is an article on “ice worms”, fascinating little creatures that live on glaciers in the Pacific Northwest and die and turn to mush at even moderate temps. Go here for photos and more detailed info. “On Suiattle Glacier, … on the south side of Glacier Peak, the recorded mean density was ~2600 ice worms per square meter in 2002. With an area of 2.7 square kilometers, this represents somewhat over 7 BILLION ice worms on this glacier! This is more than the earth’s entire human population on just one glacier”. I have just finished Rod Dreher’s Crunchy Cons, and I am delighted to say that it exceeds all expectations. Dreher, formerly of National Review and now a reporter at the Dallas Morning News, is a young conservative who argues for a new– read, “older”– kind of conservatism, one that values land, nature, family, tradition, locality, and “smallness” more than unrestrained greed and the market. He quotes agrarian Wendell Berry at length and with approval, as well as leftish James Howard Kunstler and Buddhist economist E. F. Schumacher. He advocates bridge building instead of division (this alone may make his ideas threatening to card- carrying Republicans). At first I was taken aback by the sometimes vitriolic response in the blog world to him, his ideas, and his friends. One idiot actually wrote in to call him a hippie, told him to “go back to his commune”, and bragged about his McMansion and his long commute, saying it let him spend more time away from his wife and children. Poor wife and children! (Or as Dreher noted, maybe they were better off with him away). But then I realized what I suspect is going on: these guys are feeling guilty. Because, if you take Dreher’s ideas seriously and you are living a life of serial consumption, you have to change your life. They want to kill the messenger. Constant themes in the book are eating well, consciously, and locally; living if possible close to your work; reducing your dependence on such things as TV; thinking about home- schooling your children; caring for the environment and practicing good stewardship; and realizing that beauty is real and important, not just a luxury. He and his family live by those rules, at some sacrifice, and have found them rewarding. On a “meta” level, he also decries our dependence on oil, and know it cannot last (yes, he believes global warming exists). The other great point he makes is the importance of religion in his and many other “Crunchy Cons”” lives. He is a Catholic in an Eastern Rite parish, but he mentions and interviews Evangelicals, Eastern Orthodox Christians, Jews, and even a few self- desribed “secular humanists” who conform to his ideas. What he does insist on is that, whether one follows a particular path or not, that some sort of “.. active religious imagination– an ability to see the material world in spiritual terms”– is “key”. I suspect he would say that it is much easier to make difficult choices if you do so from within a tradition. As one who has somewhat fallen away from my Catholic tradition but who is respectful of and intensely interested in (and convinced of the human importance of) religion, I think– hope– I qualify. Some of my best and most thoughtful conversations lately have been with my son’s Eastern Orthodox pastor. One small thing I was worried about was that Dreher’s respect for (vegetarian) writer Matthew Scully might mean that he was uncomfortable with hunting and carnivory. I should have realized that a boy who grew up in rural southern Louisiana would have no such prejudices. Dreher is an enthusiastic meat eater– he only asks that animals be treated with respect and fed naturally. He explicitly endorses thoughtful hunting. This book is “aimed” at conservatives, but I wonder if it might not resonate just as much (more?) with a lot of liberals disillusioned with trash culture and “Big Gummint”. I know I will get several loaner copies and spread them around– and I (a small “c” conservative if such labels mean a thing today) know that almost everyone I think will like it is nominally on the (non- moonbat) “left”. One thing though Rod, if I may be permitted a bit of irreverence: lose the cover when you go– as you will– to paperback. A rusting VW microbus with a kayak (if that’s what it is) on top and a Republican elephant on the front, with a suited arm waving out the window, plays to the dumbest stereotypes of left and right. Your book is about breaking them among other things. Related note: I am now reading James Howard Kunstler’s book The Long Emergency, about the impending crash of the fossil fuel economy, a subject that is ominously linked to Dreher’s. I may also get Richard Manning’s Against the Grain, about agriculture’s effects on humanity. Stay tuned. My friend Bodie, martial artist and Japanese sword collector, has been flying my hawk because of my lack of a working car and his of a bird. 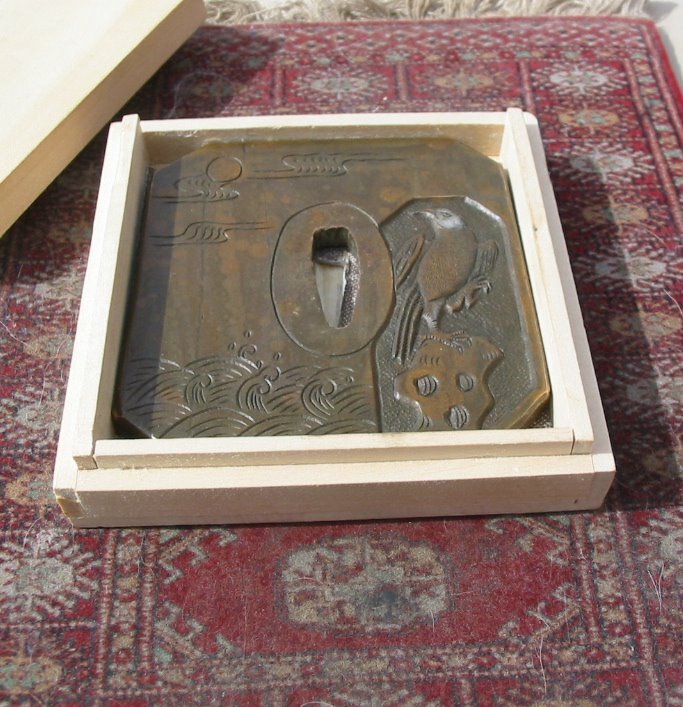 Yesterday he gave me an incredible object: a “tsuba” or Samurai sword guard dating from somewhere between 1645 and 1700. It bears the image of a stylized goshawk, the choice of Japanese falconers from at least the Tokugawa shogunate until the present. I’d rather be poor with wonderful possessions like this than rich. Thanks, Bodie. Since the anthropologists won their lawsuit in 2004 and obtained the right to study Kennewick Man’s remains, I have been waiting for the studies to come out. In today’s press release it appears that Doug Owsley of the Smithsonian is first out of the gate. Here’s a quick run-down of some findings. This was an intentional burial. He was placed 2-3 feet below the original ground surface, and the burial was what we call “extended” or laid straight-out on his back. He was buried parallel to the river, head pointed upstream. One question that occurs to me is if they have been able to obtain any DNA from the remains. 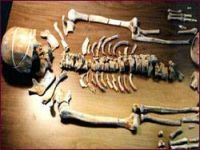 It’s possible – I saw a recent study that obtained some from a burial in Alaska a thousand years older than Kennewick Man. We’ll see. Also I have not heard if there is any move to try to work at the original find site. The Corps of Engineers covered it with tons of rock, hopefully it sealed it in and didn’t destroy it. It would be good to know if this was an isolated burial or part of a larger site. Recently, in the incomparable 2Blowhards * , Donald Pittenger was carblogging. 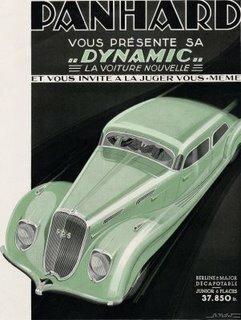 He described how the French carmaker Panhard, in the Thirties, made an attempt to make cars with the steering in the middle, and with curved windows on the sides. He explains plausibly why this was not a success, though I would rate the car’s esthetics a bit higher than he does. But it got me to wondering why the French always seem to make things that look different, in cars (Panhard, Citroen) and in other things. One object that I am more than familiar with is the French shotgun. There have been many odd French gun designs, some as weird as the Panhard, but one that persists, even if it does not conquer, is the Darne. It has been in continuous production since the 1890’s because it is GOOD! 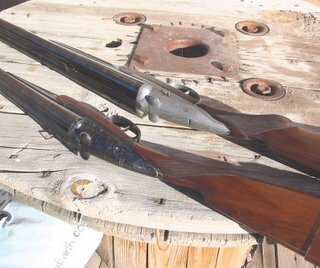 Most double shotguns, like this old American Parker, “break” on a hinge between the barrels and the action. The barrels drop down when you move a lever on the top, or, less commonly these days on the bottom, sideways. This is the near- universal standard in guns these days, from Russian and Brazilian models worth a couple of hundred dollars to English “Bests” like Purdeys that now go for over $100,000. For many reasons– for instance, you can see at a glance if it is loaded or not, and so can your companions (yeah, though it didn’t help the Veep’s buddy)– it will doubtless continue to be. But the design has a few inherent problems. All that flexing eventually makes for wear, and even a Purdey must someday go in for repair. 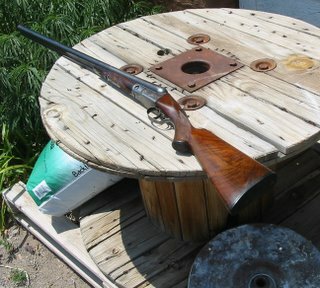 The dark one is my little 28 gauge quail gun; the silvery one is my big “ball and shot” twelve, the one shotgun so far I have ever had made for me. See those little tabs behind the action? 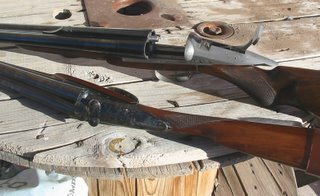 When you pull them up , the breech block slides open, backwards, while the barrels remain in place. The frame is as rigid as a muzzleloader’s. Darnes never wear out– they just get smoother. And in the old days, they built elephant caliber guns on the same frames, with no extra reinforcement. Some think they are weird. I love their looks and function. And they cost a hell of a lot less than Purdeys. “Books have already found the optimal size. “You will never be alone with a poet in your pocket,” John Adams told one of his sons—and that was two centuries ago, long before paperbacks. Big books push the limit; some readers of Vikram Seth’s A Suitable Boy razored the tome into eight or 10 more portable sections. 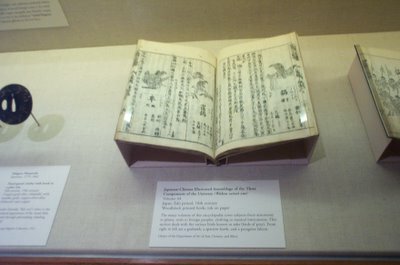 But one reason the book has had such a long run is that most books fit the hand.